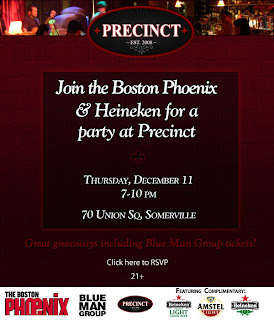 The Boston Phoenix (Stuff@Night) and Heineken are teaming up this Thursday 12/11 at Precinct. As far as I can tell from the invite, there's no reason in particular, but then again who needs a reason to party? Party starts at 7pm and goes until 10pm. Precinct is located at 70 Union Sq in Somerville. 0 Response to "Stuff@Night & Heineken Party at Precinct - 12/11"